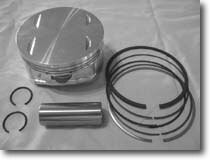 Our new forged DR650 piston is stronger, lighter, resists heat better and revs quicker than the OEM cast piston. Available in stock bore only. Note: Replating of the cylinder may be necessary if the Nikasil coating is excessively worn. Call for info on this.